The fundraising we do continues to be essential to the school and to the student experience. From designated funds to special projects, your generosity permits the continued investment in and improvement of our academic programs, co-curricular opportunities, equipment and facility. Your gifts have a positive impact on every facet of the school experience, meaning you’ve directly enriched the lives of our amazing students. Annual Giving is the foundation of all fundraising we do at the school. 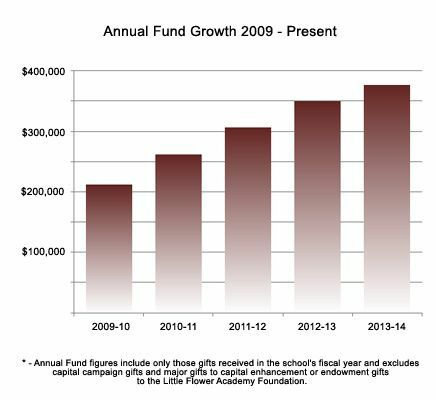 Money raised is directly invested in the programs, resources and opportunities that make a Little Flower education so exceptional. We do more than just cover a budgetary gap with the Annual Fund: we invest in the tangible things that form each girls' experience. Annual giving this year exceeded $385,000. We hit our goal of $320,000 so early this year that we started the early planning for spending on items that we had anticipated wouldn't be possible until future years. That's the best part about annual giving. The more we raise, the more we invest in the girls. To see the impact that your giving has made, please read some of our giving stories. This year's Walkathon was also the most successful we've known as a school. Raising in excess of $50,000, our students did an amazing job of contributing to their own education. Though the school didn't directly benefit, our community also dug deep to rally around fellow student Shawntel Escobar '14, bringing in nearly $30,000 to help her family with the challenges they face in her ongoing recovery from cancer. If you haven't read the story, you really should. Our Parents' Auxiliary also did amazing work this year, with another successful Ad Lucem Gala that raised tens of thousands for the school campus. The school’s endowment fund continues to grow with gifts and commitments of more than $40,000 made this year. 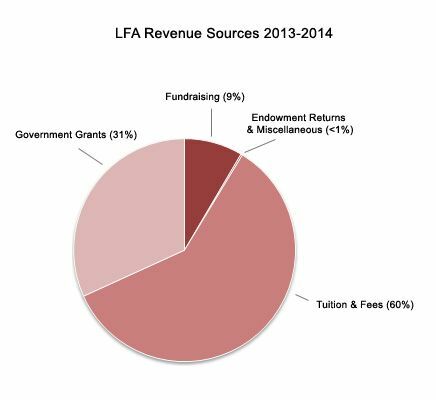 Endowment, held in trust by the Little Flower Academy Foundation, currently represents a tiny wedge of school revenue but with the expansion of the LFA Foundation Board of Trustees under Chair Georg Casey's direction, we have plans to make big strides in the near future. A key strategic priority, we will continue to build this essential resource to deliver the vision set out by the Sisters of St Ann.